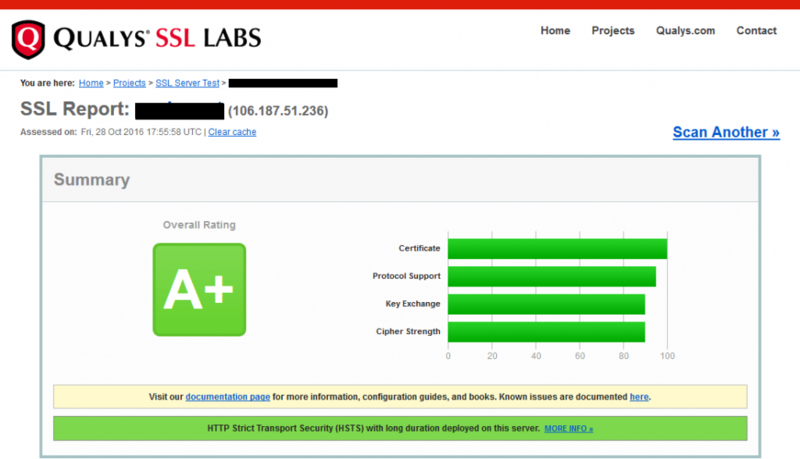 A few steps to install Let’s Encrypt on Debian with Nginx and score a A+ grade on SSL Labs. We will install Certbot to simplify the creation and renew of SSL certificates with Let’s Encrypt. Simple tutorial that can help you setup Let’s Encrypt with Nginx in just a few minutes. Login via SSH on your server as root. *** Make sure to enable jessie-backports on APT sources.list. The SSL certificate created by Let’s Encrypt is valid for 90 days. certbot renew --webroot --noninteractive --post-hook "service nginx reload"
------------------------------------------------------------------------------- Processing /etc/letsencrypt/renewal/www.example.com.conf ------------------------------------------------------------------------------- ------------------------------------------------------------------------------- Processing /etc/letsencrypt/renewal/www.test.com.conf ------------------------------------------------------------------------------- The following certs are not due for renewal yet: /etc/letsencrypt/live/www.example.com/fullchain.pem (skipped) /etc/letsencrypt/live/www.test.com/fullchain.pem (skipped) No renewals were attempted. 0 */12 * * * root certbot renew --webroot --noninteractive --post-hook "service nginx reload"
* But make sure to delete /etc/cron.d/certbot if you use /etc/crontab! 0 */12 * * * root test -x /usr/bin/certbot -a \! -d /run/systemd/system && perl -e 'sleep int(rand(3600))' && certbot -q renew --post-hook "service nginx reload"
# /etc/cron.d/certbot: crontab entries for the certbot package # # Upstream recommends attempting renewal twice a day # # Eventually, this will be an opportunity to validate certificates # haven't been revoked, etc. Renewal will only occur if expiration # is within 30 days. SHELL=/bin/sh PATH=/usr/local/sbin:/usr/local/bin:/sbin:/bin:/usr/sbin:/usr/bin 0 */12 * * * root test -x /usr/bin/certbot -a \! -d /run/systemd/system && perl -e 'sleep int(rand(3600))' && certbot -q renew --post-hook "service nginx reload"